For this recording on Festival, producer Pat Aulton recruited the members of Tymepiece, a Sydney band that originated as punk/garage band The Black Diamonds in the New South Wales coal town of Lithgow. See The Blog for commentary on The Black Diamonds' classic song See The Way. Single on Disques Salvador - Philips by popular French singer, guitarist, songwriter and TV host Henri Salvador (1917-2008), born in French Guiana. He was also popular in Brazil and is thought to have been influential in the development of bossa nova through his song Dans mon île (1957). • Spanish: El León Duerme Esta Noche YouTube. The same backing musicians are heard on each record. Reference, further reading: 1. Wikipedia article is a good summary and has links to other sources. See also the article on bossa nova which mentions Salvador's contribution. 2. Henri Salvador biography by Steve Huey at AllMusic. Single on Pathé Marconi, December 1961, by Spanish singer (1922-2005) who worked in Mexico (her adopted country) and France. Also on EP Et maintenant (1962) on La Voix De Son Maître, a subsidiary label of Pathé Marconi. These lyrics differ from those on Henri Salvador's slightly later release. Merci à Philippe de me signaler cette version. The lyrics are by George Weiss, who reworked Wimoweh and added the "lion sleeps tonight" lyrics after the Tokens decided to record their version of the Weavers' 1951 record. Peretti and Creatore were a top producing team at RCA known as Hugo & Luigi, or 'Huge & Luge' as the Tokens called them. The name of Albert Stanton, added after the initial release of the single, was a fictitious credit often used by the original American publishers of Wimoweh in the early 50s, especially for songs believed to be out of the public domain. See Rian Malan's article, cited below. Further reading: For a good summary of this New York group, see Tom Simon's Tokens Page. Three members of The Tokens went on to form Cross Country in the 70s: see In The Midnight Hour. Wild version of The Weavers' record by Glasgow-born singer (1931-1998), real name Angus McKenzie. See tribute to Karl Denver at the Billy Fury website. See also My Canary Has Circles Under His Eyes. Produced, with orchestra and chorus, by Gordon Jenkins for the Vanguard label. 'Paul Campbell' was a name used by the Weavers as a group songwriting credit. The Weavers were Pete Seeger, Ronnie Gilbert, Lee Hays and Fred Hellerman. The impassioned vocal line on Wimoweh is performed by Pete Seeger. Seeger, who transcribed the lyrics from the original African recording, rendered the Zulu chant Uyimbube, uyimbube as "Wimoweh, wimoweh". Wimoweh was a huge success, and was recorded by numerous artists including Yma Sumac (1952), Jimmy Dorsey (1952), The Kingston Trio (1959) and Miriam Makeba (as Mbube, 1960). More versions: See the list of versions compiled by Fred Clemens at Bob Shannon's Behind the Hits [archived page]. This site has links to audio of many versions at YouTube. 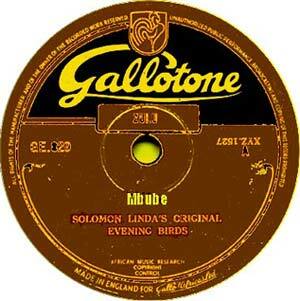 78 rpm record on Gallotone label (see label scan at 3rd Ear Music). Not a traditional song, as sometimes supposed, but an original song composed by Solomon Linda (1909-1962) in the Johannesberg studio of Eric Gallo. The story of Mbube-Wimoweh-Lion Sleeps Tonight is long and complicated. The definitive account is by Rian Malan in his article Where Does the Lion Sleep Tonight?, first published in Rolling Stone but reprinted online at 3rd Ear Music along with an extensive follow-up discussion. Although he was uncredited on earlier versions of his song, Solomon Linda's status as the original composer has been reinstated over the years, and there have been moves to have some of his long due royalties paid to his family. Singer from New York (b. 1946), full name Robert John Pedrick Jnr, whose biggest hit was Sad Eyes in 1979 (#1 USA). His first minor hit was in 1958 at the age of 12 under the name of Bobby Pedrick. See his biography at All Music Guide. The title and songwriting credits on Robert John's version cover all bases: they represent a potted history of the song. (#9 Adelaide) More on Dove here. In the 90s, The Lion Sleeps Tonight was heard in Disney's The Lion King and in the Jim Carrey film Ace Ventura: Pet Detective. For other versions, see Rian Milan's article, Fred Clemens's list and this page.